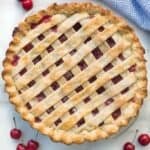 Homemade Cherry Pie is such an easy pie recipe and works great with fresh or canned cherries, so you can enjoy cherry pie all year round! For how much I LOVE pie, I’m completely ashamed that I’m missing a few classic recipes here on this blog. 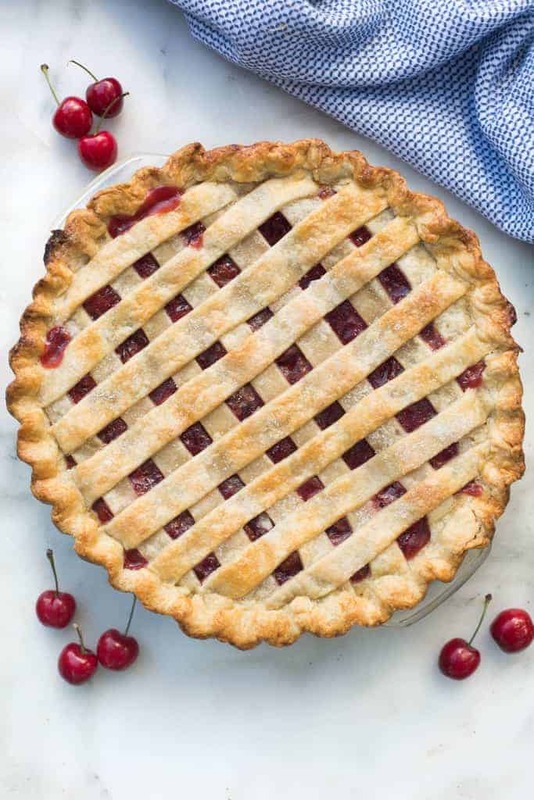 Cherry Pie–HELLO–is one of the easiest and most traditional pie recipes around. So, it’s about time I got a recipe up here for you guys! I have ambitions to get my favorite peach and apple pie recipes up soon too. I seriously can’t believe I have not shared those recipes yet! If you were to search “pie recipes” on my blog you would notice I do have about 1,000 different types of LEMON pie. Apparently it’s my favorite. I guess that’s my problem. Lemon pie may be my favorite, but that doesn’t mean I discriminate on all other pies! I would take a delicious slice of cherry pie ANYIME! So yummy. And that’s one thing I LOVE about this recipe. 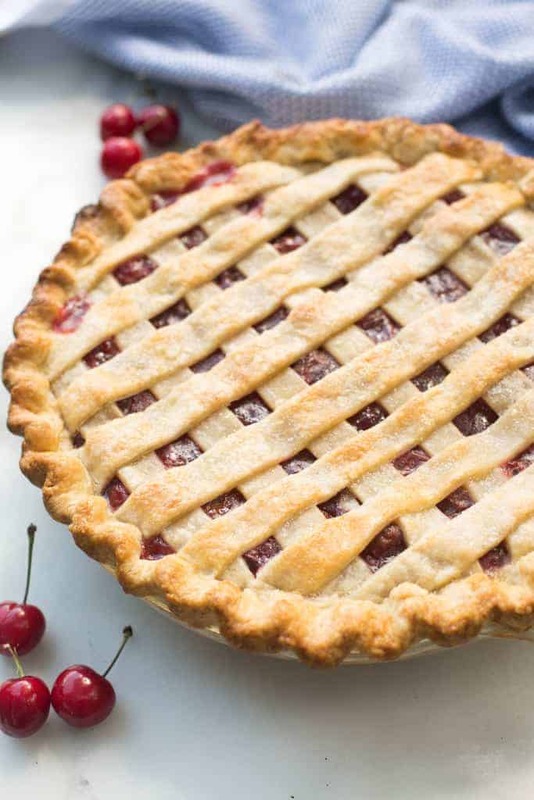 You can use fresh or canned cherries, so you can enjoy cherry pie all year round. Should you use Sweet or Sour Cherries for cherry pie? I’ve always used sour cherries when making cherry pie. If you want to use sweet cherries then I would decrease the sugar in this recipe by at least 1/3 cup. Nothing compares to a homemade pie crust! I’m such a huge fan of homemade pie crust, especially for pies like this that bake for longer in the oven. (If you’re making a custard or pudding type of pie that only requires a pre-baked pie shell, then go ahead and use a store-bought crust.) For this type of recipe it really makes a difference in how your pie tastes and holds together. Most store-bought pie crusts are super thin and flimsy so the edges brown and dry out really quickly in the oven. Plus, my favorite pie crust recipe can be made weeks or even months in advance so that your pie dough is ready to “roll” (pun intended 🙂 ) when you need it! I love when my cherry pie filling has a beautiful red filling. Depending on the cherries you use, you may want to add a few drops of red food coloring to the filling to give it some more color. I’ve found this particularly necessary when using canned cherries. It really makes the pie look more appetizing when the filling is a bright cherry red. If you’re against adding food coloring to things then you don’t need to. Soooo, I’m super lazy and don’t usually take the time to make a traditional “lattice crust” on pies like this, mostly because when you pull back certain strips to make the “over-under” pattern you’re dealing with red-dyed pieces of dough (from the pie filling) and it can be tricky to make it look nice. However, here’s a lattice top tutorial for you go-getters that are interested in doing it the traditional way. I always just lay my first layer of crust going one direction along the pie–with about 1/4 – 1/2 inch of space between each strip of crust. Then I lay a second layer on top, going perpendicular. Super easy and fast. Pit and halve the cherries. Add them to a mixing bowl with the sugar, cornstarch and lemon juice and toss to combine. Set aside while you prepare the pie crust. (When using fresh cherries you don't need to cook the mixture, like you do with the canned cherries). Drain the juice from the cans of cherries into a saucepan, reserving 1/4 cup in a small bowl. Set the cherries aside. Add cornstarch to the bowl with the reserved 1/4 cup of juice and stir well to combine. Heat the saucepan (that has the juice in it) over medium heat. Add the sugar and stir well. Bring mixture to a low boil. Stir in dissolved cornstarch mixture. Cook, stirring, until thickened, about 1-2 minutes. Stir in butter and lemon juice. Fold in the cherries. Add a few drops of red food coloring, if desired. Allow mixture to cool to room temperature while you prepare the pie crusts. Preheat oven to 400 degrees F. Grab your 9'' deep dish pie pan. (You can use a regular 9'' pan but you may have more filling than you need). Remove one chilled pie crust dough from the fridge. On a lightly floured counter, roll out your dough to about 12'' in diameter. Gently place in the bottom of your 9'' deep dish pie dish. Spoon the cherry filling into the unbaked crust and sprinkle a little cinnamon over the filling. Pinch the edges of the top and bottom pie crusts together and crimp the edge, if you like. Brush a thin layer of beaten egg white over the top of the pie crust and sprinkle the crust pieces lightly with granulated sugar. Bake at 400 degrees F for 40-45 minutes. Check it after about 25 minutes and gently place a piece of tinfoil over the top crust to keep it from getting too brown. I remove this tinfoil about 5 minutes before it's done baking. Remove to a wire cooling rack and allow to cool for several hours. Once cooled completely, you can cut and serve it, or cover it and refrigerate it overnight to serve the next day. 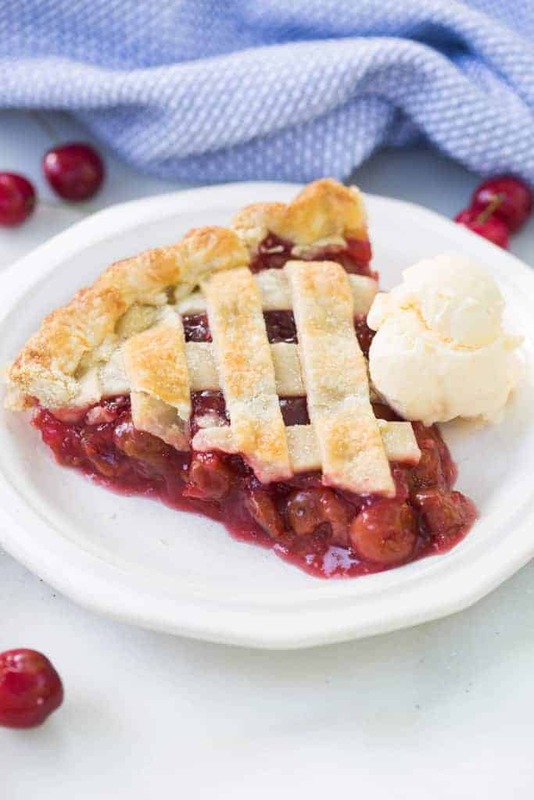 Do you have a recipe for cherry pie using canned tart pitted cherries in water? At this point I do not :)! Hopefully in the future. Easy, easy and delicious. I accidentally put all the ingredients, including the cherries ? in the saucepan before I realized I was to make the sauce separately. I went ahead and cooked and the filling turned out perfectly. Very forgiving recipe. I just made this today for my husband’s birthday. I used FROZEN SWEET CHERRIES from Costco. I used 8 cups of frozen cherries. I thawed the cherries in a saucepan so they gave off some of their juice, then followed the rest of the recipe as written except using 6 TB cornstarch instead of 1/4 C, and used 1/2 C Splenda instead of sugar. I did not discard any of the juice. Cherry Pie PERFECTION! THANK YOU!!! If you’re lucky enough to have a Dollar Tree where you live, they offer wonderful Morello Cherries in a 12.5oz jar. Perfect!